Port Chester Village Hall is located at 222 Grace Church Street, Port Chester, NY 10573; phone: 914-939-5200. Photo: Bush-Lyon Homestead, ca. 1720, King Street, Port Chester, NY. Listed on the National Register of Historic Places in 1982. Photographed by User:Magicpiano (own work), 2012, [cc-by-3.0 (creativecommons.org/licenses/by/3.0)], via Wikimedia Commons, accessed August, 2015. First settled about 1660 the village was incorporated in 1868. The earliest inhabitants of the area known today as the Village of Port Chester  were the tribes of the Mohegan Indians. English settlers eventually migrated from Connecticut in 1660 to inhabit the area. Around 1732, the area began to be called Saw Pit or Saw Pit Landing because of the saw mill and boat building shop that had been established by the English near the mouth of the Byram River. The settlement grew slowly with the primary commercial activities involving logging, shipbuilding, farming and trade, and particularly the shipping of produce by boat to New York City. During the Revolutionary War, the Saw Pit became an important military outpost due to its accessibility to surrounding waterways and the views offered by Bloomer's Hill. Both armies vied for possession of the port, and the Village was nearly destroyed in the crossfire. 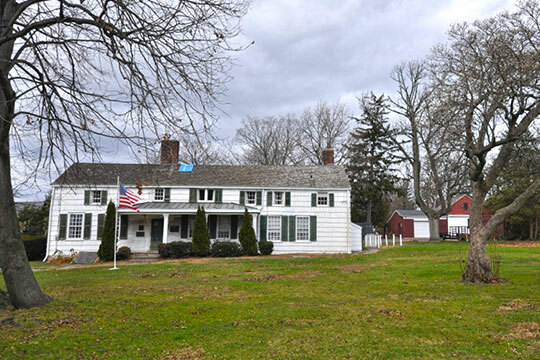 In addition to the area's significance as a military outpost, the present day John Lyon Park homestead served as the headquarters of General Israel Putnam. After the Revolutionary War, the area was rebuilt and boat building, farming and shipping industries prospered. As well as being known for its shipping industry, the area's reputation was also based on its production of stoves and furnaces. The Abendroth Foundry, established in 1840 (ceased operations in 1920), was one of the largest foundries on the east coast, shipping stoves and furnaces around the world. The onset of the Civil War saw the Union Defense Committee in Port Chester muster the first Civil War Company (Company B, Seventeenth Infantry) to serve as a body in Westchester County. By the time Port Chester was incorporated as a Village on May 14, 1868 within the Town of Rye, the shipping, foundry, and agricultural industries were well established and were sustaining a strong local economy which included 3,500 inhabitants, two banks, several coal and lumber yards, a railway station and a few dozen stores. The agriculture and shipping industries began to decline when major railroads started to be built in the area. As a result, the economy evolved from one dependent upon its port for trading purposes to a manufacturing center. This industrial shift also caused demographic changes in the Village as new employment opportunities began to attract large numbers of European immigrants. Early noteworthy industries in Port Chester include the Earnest Simons Manufacturing Company, which in 1876 was first in the world to produce ready-made sheets and pillowcases (it also developed the Fruit of the Loom trademark which was later sold), and the Russell, Burdsall and Ward Nut & Bolt Company that was established in 1882. Regular steamship service between Port Chester and New York City began in 1870 and continued until World War I when truck transport became more economical. The last two decades of the nineteenth century saw public services expand with the establishment of the Port Chester Water Works in 1884, replacing the many private wells and cisterns with dependably potable water from nearby Connecticut reservoirs, along with the founding of a community hospital, and the installation of a trolley service. Roads were widened and paved and sewers and drains were installed as motorcar traffic increased in the 1920s. Port Chester sent over 5,000 men to serve in the two World Wars. By 1950, as the country enjoyed peace-time prosperity, many well-known corporations had established headquarters or production centers in the Village, including Life Savers, Empire Brush Works, Arnold Bread and Neisner Brothers (later bought by Ames Department Stores). However, over the course of the twentieth century, the economy began to shift once again, and in 1984, Lifesavers became the last major manufacturer to shut down its operations in the Village and relocate. BFJ Planning with Urbanomics for the Village of Port Chester, Comprehensive Plan, 2012, www.portchesterny.com, accessed August, 2015.